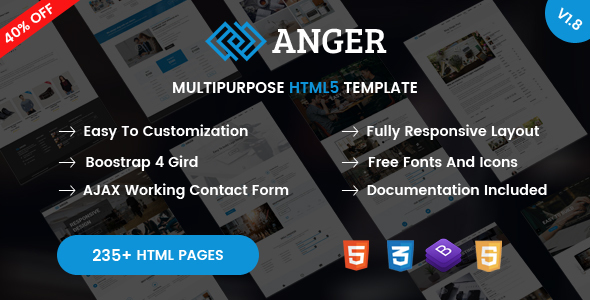 Anger is a highly creative, Business, Multipurpose Multi-Page & One-Page HTML5 Template with unique home page demos. Anger is a business multipurpose, Simple and Clean Template, based on the powerful bootstrap v4.3.1 HTML template. We have created 20+ ready to use Homepages with the inner page and 235+ HTML files with the package. it is easy to use a template with lost of features. This template is very well commented and also have proper help documentation to customize it easily. Anger is a modern and elegant HTML 5 Template. build with this template as you like. Designed for Portfolio, business, corporate, Agency, Medical, Construction, Restaurant, GYM, consultancy, Blog or shopping website. If you have a desire to create a website that has strong impression and intrigue, then anger is an good tool for you. Customizing and documenting is very easy, so it will suit your website’s needs. Every page is fully responsive, making your creation look good on any device. All images are just used for preview purpose only and NOT included in the final purchase files. Also PSD file not included. Added: "Blogging" new layout with all inner pages added. Added: "Wedding" new layout added. Added: "Tours & Travel" new layout with all inner pages added. Added: shop list & grid view functionality added. Added: Features - Header Semi transparent light - new style added. Added: Features - Header Semi transparent dark - new style added. Added: Features - "Footer 7" new style added. Added: Features - "Coming soon 2" layout page added. Added: Portfolio - "Portfolio single project 6" new page added. Added: Element - Accordions new style added. Added: Element - Form Controls new style added. Added: Element - Image Gallery new style added. Added: Element - Pricing table new style added. Added: Element - Progress bars new style added. Added: Element - Social icon new style added. Update: Product image is working with mouse zoom and zooming out. Update: Animation done on all pages after page scroll. Fixed: mobile - header cart count box design issue fixed. :: Updated: stylesheet updated regarding new page and features. "SEO Marketing" new home page added. "Web Agency" new home page added. "Agriculture" new home page added. Features: Menu Style 5 - new style added. Features: Sub Menu light new style added. Element: Color page - class name page added. "Digital Agency" Inner page added. Element: Tab new style added. Element: Icon Box new style added. Element: Counter new style added. Element: Pricing Table new style added. :: stylesheet updated regarding new page and features. "Digital Agency" New home page added. "Software Landing Page" New home page added. "App Landing Page" New home page added. Restaurant, Construction, Medical, Gym, Consultancy All layout demo Inner pages added. Prortfolio select box new page added. Blog Grid both sidebar new page added. Blog Masonry both sidebar new page added. Blog Singlepost no sidebar new page added. Blog list no sidebar new page added. New Element icon box style added. "Gym Layout" New home page added. "Consultancy Layout" New home page added. "Shop Layout" New home page added. "Restaurant Layout" New home page added. "Construction Layout" New home page added. "Medical Layout" New home page added. :: jquery.dd.js new js added. "Portfolio Layout" New home page added. :: vanilla-tilt.js new js added.